There is blood on the streets in the energy sector. Companies responsible for the drilling and discovery of oil are hardest hit. Large corporations that are involved in both the upstream and downstream are more sheltered. Out of all the companies I am most confident in XOM's ability to succeed through this mess. They have recently increased their dividend by 5.80% and with their strong balance sheet and AAA credit rating, they are the most likely to survive out of everyone. I do not particularly enjoy having my assets tied to the price of oil but am willing to buy names of high quality. Midstream companies participating in the transportation of oil can be a way to reduce sensitivity to oil prices. My favorite companies in the pipeline business is KMI, EPD, and MMP. 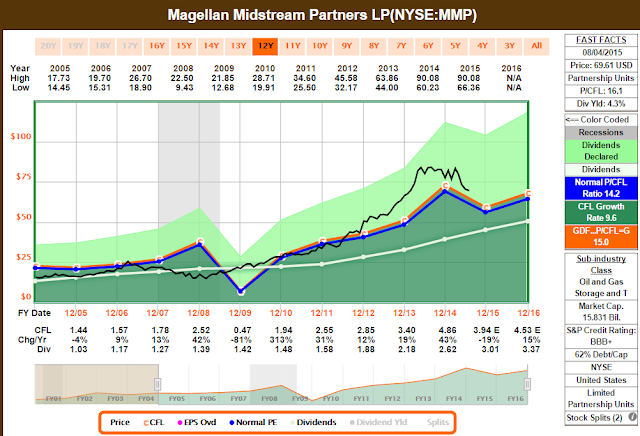 EPD and MMP are the highest quality MLPs on the market with a credit rating of BBB+, strong cash flows, and a good track record of dividend payments. I only own KMI at the moment and want to add more to EPD and MMP. Below I will describe my thoughts for the coming weeks as EPD and MMP are now hitting close to my price targets. 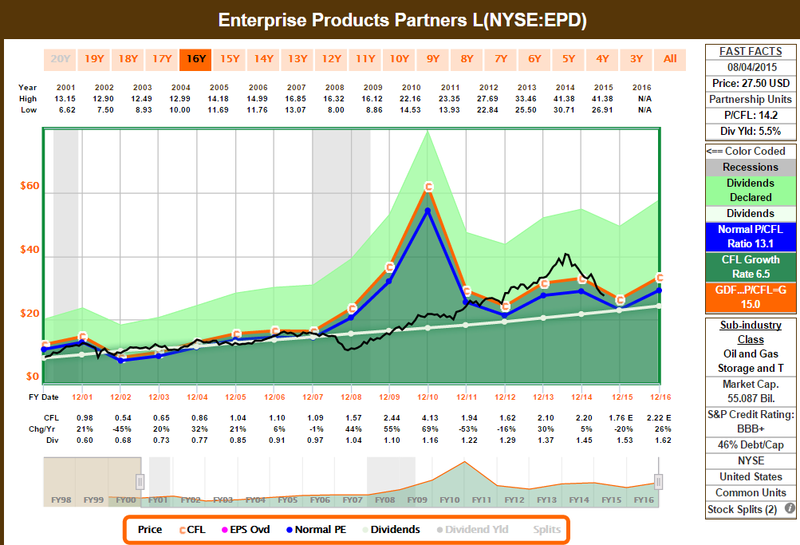 The average dividend increase is 7.9% with a deviation of 2.9% which is very consistent. With a 5.88% yield today growing at 8% this is a strong holding for the future. Jefferson Research's ratings of EPD's earning power is strong. MMP is more attractive from a performance standpoint. However EPD is of better value. In the end both still have strong cash generating abilities in the current environment. The average is 15% and the deviation is 18.5%. 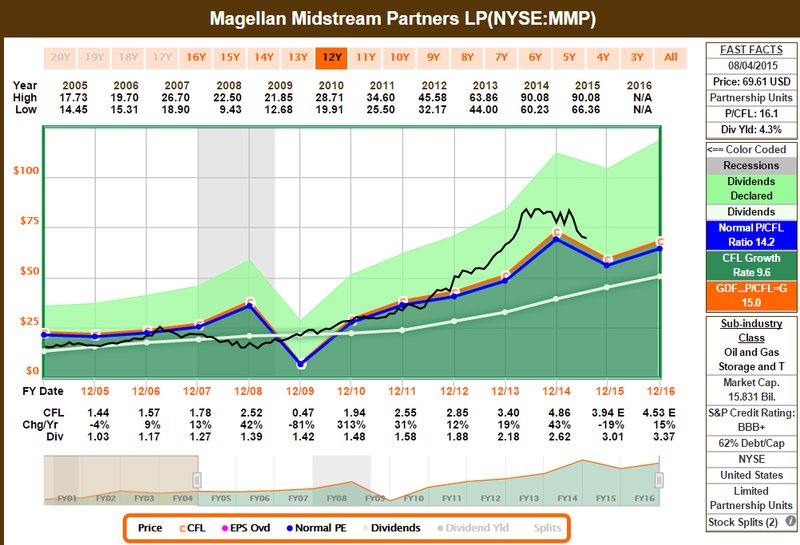 The yield is not very high for an MLP but I believe it may go over 5% if the bear continues. Jefferson Research's ratings of MMP is very strong. This is what I like to see in quality companies. I am considering trading my position in CVX for MMP and EPD. And then drip additional capital acquired in the coming months into MMP and EPD. Selling a depressed oil sector stock to buy another depressed oil sector stock which have both comparably declined is something I'm considering since CVX has not raised its dividend after 4 quarters. However, my history usually tells me I do better off when I don't do anything at all! So I'm debating removing CVX. Officially though, the dividend growth per year of CVX is still considered "increasing" (if you look at a per year time window). Presently I have more confidence in XOM than CVX in the E&P sector. But both are the strongest names in the business. I did not include KMI in this post because my position in KMI is heavy and I will only consider it if the company's price is at a 50-60% drop from its all time high. I will rather diversify to other companies.